Another BlizzCon 2015 announcement appears to have been ruined ahead of time. This time, it’s for the WoW expansion Legion. According to a background image found within the confines of Battle.net, the World of Warcraft expansion announced during gamescom 2015 is set for release on or before September 21, 2016. The image has since been made inaccessible on the website, but luckily Reddit grabbed it. 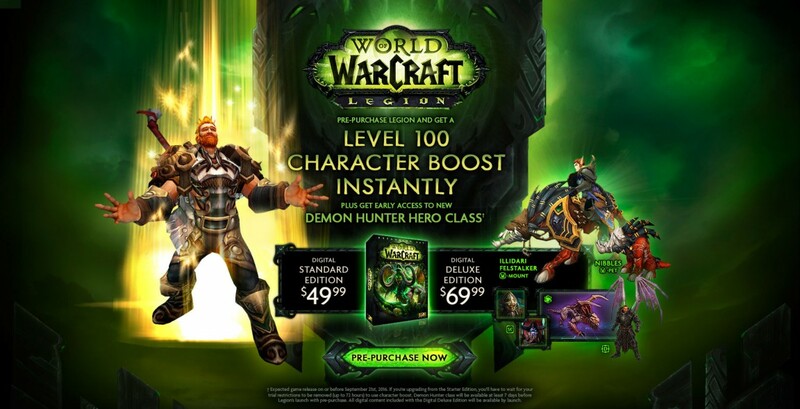 As you can see, those who pre-order Legion will be given a level 100 character boost and seven days early access to the new Demon Hunter class. Pricing for the standard edition is $49.99. A Digital Deluxe Edition will also be offered for $69.99 and it comes with a Nibbles pet, the Illidari Felstalker mount, and Illidan wings for Diablo 3. Blizzard Watch also noted the Digital Deluxe Edition contains what appears to be a Felstalker mount for Heroes of the Storm and portraits for StarCraft 2. BlizzCon 2015 kicks off with the opening ceremony at 11am PT/2pm ET/7pm UK, so we expect to hear more on WoW: Legion at that time. The official trailer for the Warcraft movie will also be shown during the ceremony, so you may want to watch it. More on Overwatch for consoles is also expected, after leaks appeared earlier this week before an official confirmation. As with every BlizzCon, we’ll have a full report on all the announcements.